In the life of every freelancer, regardless the field of work, the income cannot quite be characterized as steady. There are times that there is a flood of work and there are other times that no new project is in the horizon. Many articles have been written about the feast and famine periods, so I will not show any emphasis on them here. From the beginning of my freelance career, I thought to myself that I will try to find a part-time post, just in case I need help with the expenses at month’s end. And, if this part-time post can be related to my freelance translation work, that would be great! And so, when a part-time post opened at the Foundation for Research and Technology Hellas (www.forth.gr) and more particularly at the Institute of Computer Science (www.forth.ics.gr) I jumped straight at it! Not only it would secure some sort of income (at least until my contract with them expires or/and my business takes off), I was close to new technologies and IT, a field that I am very fond of! Fantastic! 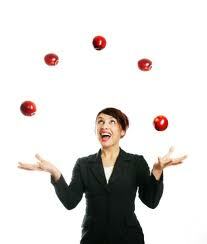 Let’s see now how I juggle my job and my business (in other words, both jobs!). There are two scenarios! 09:00 @ FORTH My shift has just started! So many things to do and only 8 hours to do them. To do: Check emails, Twitter and Facebook, eat packed-from-home breakfast at the desk, translate, write press releases, Twitter and Facebook posts, organize material that needs to be posted, proofread everything written in English, write articles for newspapers and online magazines, order advertizing material, write deliverables for the EU in English. 16:00 End of shift, time to go home! 16:12 @ home What a full day it has been! To do: Now, time for some food to keep me going! If food was left from the day before, then great! If not, a sandwich with do! Light the fireplace (in the winter) and turn on the coffee machine. 17:00 @ home office To do: pure coffee to mug, take mug to desk, check emails, check Twitter, check Facebook fan page, reply to emails, reply to Twitter mentions, reply to comments on Facebook (if any), write posts for the blog. 18:00-20:00 (summer months only) To do: quick swim at a beach nearby. 21:15 @ home To do: shower, dinner, sleep! 17:00 @ home office To do: pure coffee to mug, take mug to desk, check emails, check Twitter, check Facebook fan page, reply to emails, reply to Twitter mentions, reply to comments on Facebook (if any), start/continue project. Not to do: leave the chair unless I finish the amount of words of the day, unless I need the loo, unless it is gym time! 21:15 @ home To do: shower, dinner (if hungry)! 22:30 @ home office To do: finish the word count of the day (if any words are left). 00:00 To do: sleep! Tomorrow is another wonderful day! Of course, I need to mention that if I have to, I work during weekends and like a lot of freelance translators, work for longer hours if required, gym hours may be sacrificed (and swimming in the summer months) if needed, but my time-management skills are quite good, so I do not sacrifice them often. A freelance translator has to do what a freelance translator has to do! Loved the article, especially to going for a swim bit!! Wish I could do the same! Well done Konstantina. Thank you so much for your nice words! Heheh, yes, it is quite pleasurable! Thanks again!